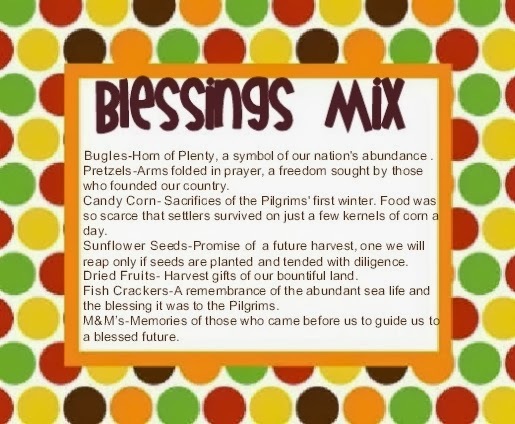 I saw a bunch of different options for making blessing mix on the net, so I took some of my favorite parts and made my own little tag. I filled these little bags up with my Thanksgiving trail mix for my table at Thanksgiving, and I also gave them away to some of the kiddo's my friends claim. 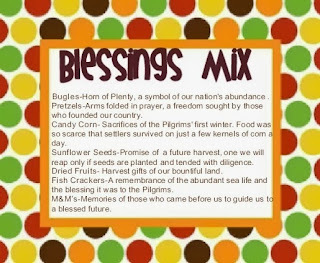 Each part of the trail mix has a meaning behind it that tell a portion of the Thanksgiving story. You can download the tag with the explanation here.